I’ve had Danny Michel on here as Song Of The Day on several occasions. This tune is called Into The Light. Danny is another Canadian secret that we are reluctant to share with the world. He has a distinct sound, part Caribbean, part Canadian. Enjoy. 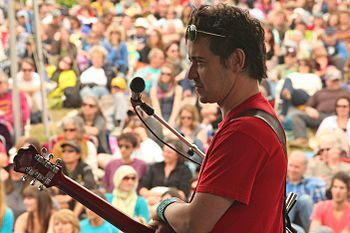 This entry was posted in Canada, Canadian Music, Music, Rock, Song Of The Day and tagged Canada, Danny Michel, Music, Song Of The Day. Bookmark the permalink. I like Caribbean, and I like calypso, but for some reason, this one missed for me. It was a bit jangly(?) to my ear.